Now that Joe Simon-Whelan's lawsuit against the Andy Warhol Foundation and Authentication Board has been dropped, it will be worthwhile to look objectively at the series of paintings it involved and the arguments over their authenticity. Although the lawsuit was primarily about antitrust matters - it is unlikely that a judge would or could authenticate a painting - it has left a lingering impression that there could be a series of Self-Portraits out there that are authentic despite the reservations of the Andy Warhol Art Authentication Board. Since the lawsuit was dropped there have been further articles on the questionable Self-Portraits contributing to this impression, including one by the Daily Telegraph's chief art critic Richard Dorment titled "What Andy Warhol Did" in the 7 April 2011 issue of The New York Review of Books. The works in question were printed in 1965 and have been referred to in the press as both the Norgus Self-Portraits and the Red Self-Portraits. I will use the term Norgus Self-Portraits in order to avoid confusion with Warhol's legitimate 1964 series of Self-Portraits. All of the Norgus Self-Portraits have a red background. The colour of the background in the authentic 1964 series varies from painting to painting. Three of the 1964 Self-Portraits have a red background. I should also add in regard to this essay that my conclusions are my own. I have never discussed this matter with the Andy Warhol Foundation, the Andy Warhol Art Authentication Board or their representatives. Richard Ekstract contacted a friend who worked in advertising, Herman Meyers, and Meyers approached Norman Locker of the Norgus Silk Screen Company Inc. in New Jersey to do prints of the Self-Portraits from the acetates. In late summer/autumn Norgus created screens from the acetates and then printed a number of Self-Portraits from the screens, retaining two in exchange for doing the work. The rest of the Self-Portraits went to Ekstract and his colleagues. The acetates were returned to Ekstract and/or Warhol. It is unknown how many Norgus Self-Portraits exist. Norgus employee, Gus Hunkele, recalls that eight were printed. The Andy Warhol Art Authentication Board has examined at least ten. (JSW7) It has been alleged that Warhol traded the Norgus Self-Portraits for an extension of a loan of video equipment and/or used them to pay for publicity and/or a promotional party. Both Richard Ekstract and Warhol's colleague at the Factory, Paul Morrissey, claim that Warhol gave his permission for the acetates to be used although they have never recalled the specifics of any meetings they had with Warhol about the works i.e. when and where the meeting or meetings took place, who was there, what was said, and what exactly was agreed. No paperwork relating to the deal has ever been found in Warhol's archives. Warhol never mentioned the series in his lifetime and the first time that any of the paintings from the series went up for sale at a public auction was after Warhol's death. Both Herman Meyers and Gus Hunkele from Norgus have issued statements regarding the printing of the Self-Portraits. Mr. Meyers's statement can be found at: http://www.myandywarhol.eu/my/pdf/9.pdf. 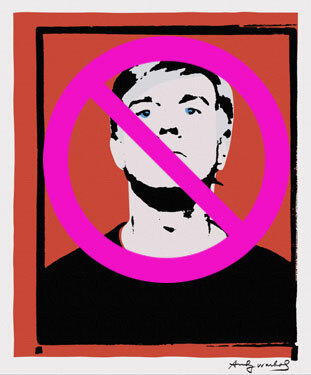 Mr. Hunkele's statement can be found at: http://www.myandywarhol.eu/my/pdf/20.pdf. In regard to Mr. Meyers' statement, it is unclear whether he discussed the Self-Portraits directly with Warhol or was working from instructions relayed to him by a third party which he believed were Warhol's instructions. In his statement, he says he "was introduced to Andy Warhol by Richard Ekstract in 1965" but does not specifically say that he and Warhol discussed the Self-Portraits at the time. Instead he speaks in general terms, such as "Andy gave Richard Ekstract the ruby mechanical of his self portrait because he wanted this art to be featured along with him in the magazine." Meyers is claiming that the reason Warhol gave Ekstract the ruby mechanical was to facilitate the printing of Warhol's Self-Portrait in Ekstract's magazine, Tape Recording. Yet, he also says in his statement, "As I understand it, Andy had made an arrangement with Richard to extend his loan of the Norelco video recorder and camera. I believe that's why Andy authorized Richard to make several self portraits for himself and a few of us who helped him produce the underground premiere." (JSW10) But if the prints were to pay for the extension of the loan of the Norelco equipment why did Ekstract, Meyers and Norgus get the prints rather than representatives of Norelco? The use of the term "as I understand it" implies that Meyers was told the information by somebody else. When did he learn of the arrangement for an extension of the loan of the equipment? In 1965 or when he was writing his statement? Meyers recalls that he contacted silk screener Norman Locker to do the prints. Norman was presumably the "Nor" of Norgus - the business partner of Gus Hunkele who was, presumably the "Gus" in Norgus. Meyers continues, "Explicit direction for the screening was provided on the ruby mechanical in writing by Andy as well as by telephone." But is he referring to new directions by Warhol or the directions on the ruby mechanical that Warhol wrote in 1964 for the original, authentic Self-Portraits? When he refers to telephone directions, is he claiming that he spoke to Warhol himself or that somebody else told him there was telephone contact? It's difficult to know from the statements in this case whether the people are recalling what they were told (i.e. hearsay) or what they actually witnessed. No specific details of conversations with Warhol are given. One of the differences between the 1965 Norgus Self-Portraits and Warhol's legitimate 1964 Self-Portraits is that the 1964 series is printed on linen while the 1965 Norgus series is printed on cotton. Meyers deals with this in his statement, writing "I do remember that Andy was very specific in instructing Norman on which paint formulations to use and the order in which to lay them down. This was of utmost importance to Andy. At the time, the recommended canvas supplier had only cotton canvas in stock for the reproductions - so we used that." Did he actually witness Andy instructing Norman on paint formulations? Meyers says that they used cotton canvas "for the reproductions" because that's all the supplier had in stock. He doesn't say that Warhol told them to use it. Would they have made the decision on their own if they had been in contact with the artist? Note that Meyers refers to the Self-Portraits as "reproductions" in his statement. Yet, it has been alleged that the Norgus prints were original paintings and should be authenticated as such - not as "reproductions." Gus Hunkele at Norgus says in his statement that he did not have any direct contact with Warhol. In fact he didn't even have any contact with Ekstract: "I did not meet Andy Warhol or Richard Ekstract personally but my business partner [Norman Locker] met Ekstract." He doesn't claim that Locker had any contact with Warhol. If Warhol was going to issue directions as to how the works were to be printed it would seem logical that he would contact the printer. He didn't. It was Ekstract who gave the company "Andy Warhol's printing instructions." "In 1965 Herman Meyers who worked for an advertising agency asked if we would print several portraits by Andy Warhol for Andy Warhol and Richard Ekstract... Mr. Ekstract and Herman Meyers delivered the supplies to the company. Extract met with my partner who then turned him over to our shop foreman to whom he gave Andy Warhol's printing instructions... Norgus followed these verbal instructions as well as the written instructions on the positives and swatches." "Andy Warhol's printing instructions" were instructions given to Norgus by Ekstract who told them that they were from Warhol. Hunkele recalls that Norgus "printed eight stretched canvases two of which were retained with the four test canvasboards as payment for printing of these portraits for Ekstract." He also notes that he understands that "the Screen Portraits were meant to be gifts and to be delivered to Warhol by Ekstract" and that he had "no knowledge of any of these works were made to be used a cover for a magazine or as promotional materials for an underground party." The fact that Fred Hughes dated Double Denied as 1964 rather than 1965 (when Norgus printed it), indicates that Hughes thought it was one of the authentic 1964 Self-Portraits or wanted it to be considered as such. When Hughes authenticated the work in early 1988, the Warhol Foundation was in its infancy. There was a lot less information available in early 1988 about the materials and methods used by Warhol than there is today. Having dated the painting 1964 it is likely that Hughes was unaware of the fact that a group of Self-Portraits were printed the following year (1965) by Norgus using acetates ("film positives") from the 1964 series. "I didn't know it at the time, but Fred has a big problem. There are a large number of unsigned works believed to be authentic Warhols but they will be hard to move unless he can prove they are genuine. Fred stands to make a bundle if he is willing to authenticate these works. I begin to see that Fred is in fact very, very willing to do this - in exchange for a piece of the action. In the spring of 1989, I find out that art dealer Robert Miller, who owns the Robert Miller Gallery on East Fifty Seventh Street, bought a series of Warhol's Superman drawings for $175,000 from an Italian dealer after Fred authenticated one of them. Somehow, as part of the bargain, Fred himself wound up with a drawing from the series. 'He asked me for it,' says Miller. 'Whaddya mean he asked?' I'm getting very worried about Fred. 'You know,' Miller adds, 'I don't know if he took the drawing for the estate for for himself. 'Well, they're no good anyway. he authenticated them, but I can't sell them, so you've got to make good on them,' Miller says, and he's right." Joe Simon-Whelan mentions the Superman drawings in his Complaint. According to the Complaint, the Foundation rejected Miller's request for reimbursement but did award him with a large showing of Warhol's photographs from the Foundation's collection. (JSW5#76-78) On one hand Simon-Whelan offers Fred Hughes' authentication of Double Denied as proof of its authenticity (despite the fact that Hughes got the date wrong) and, on the other hand, he seems to be indicating that Hughes' authentications are undependable by bringing up the situation with the Superman drawings in his Complaint. On 2 February 2002 the Authentication Board rejected Simon-Whelan's painting (Double Denied) and stamped it "denied." (JSW5#120) After further research Simon-Whelan re-submitted the painting to the Authentication Board during the first week of February 2003. (JSW5#125) It was rejected again. The Authentication Board informed him of the second rejection in a letter dated 14 July 2003. (JSW#127). Double Denied was not the only painting that Simon-Whelan submitted to the Authentication Board. On another occasion he submitted a work signed by Andy Warhol which featured a blank canvas with real dollar bills attached to it. He had purchased it from Warhol's companion Sam Bolton. The work was denied by the Board after they noticed that the dollar bills were signed by a Secretary of the Treasury who took office in September 1988. Warhol died in 1987. (JSW4p.115) Given that a dead Andy Warhol could not have attached the bills to the painting, the (authentic) signature on the canvas did not, in itself, signify that the painting was authentic. Dorment would later become one of Simon-Whelan's chief supporters in the pages of the New York Review of Books over Double Denied. His first article, "What is an Andy Warhol?," (22 October 2009) can be found here and his second article, "What Andy Warhol Did" (7 April 2011) is here. Between the publication of those two articles, a series of exchanges took place that involved Dorment and others. A list of the articles can be found here. In regard to Double Denied, Simon-Whelan filed his class action suit against the Foundation and others on 13 July 2007. He continued to research the circumstances surrounding his painting and during that research discovered that a work from the same series had actually been signed and dated by Warhol. It was owned by the collector/dealer Anthony d'Offay and was one of the group of paintings that d'Offay planned to donate to the Tate Modern in 2008. It has become known as the "Bruno B" painting because it was inscribed to "Burno B" [sic] by Andy Warhol.